I’VE DONE IT !!! 31 days of running everyday in the month of December 2009. It wasn’t easy to run everyday. Too many obstacles and distractions. I ran early morning, late afternoon and sometimes at night. The only time that I didn’t run was in the mid afternoon – lunch time. I ran on the road, off road and on treadmill. I should have done also stairs running, that would make it more challenging. My total runs for this month alone equals to 117.24km with distance ranging from 1km to 10km. Some days I’m too lazy to run but I have to, so I just ran from my home to Roundabout Tiong Hin (1.82km) or running along the river. I ran solo and sometimes in group of 2, 3 and 4. Other days I would do run-bike or bike –run training just to mix it up. 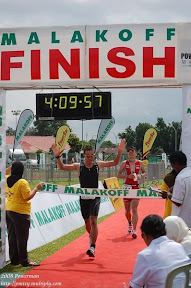 Tomorrow will be the 1st day of 2010 and I only have 5 months to prepare for the Ultramarathon. Hopefully I can improve my 2008 time.